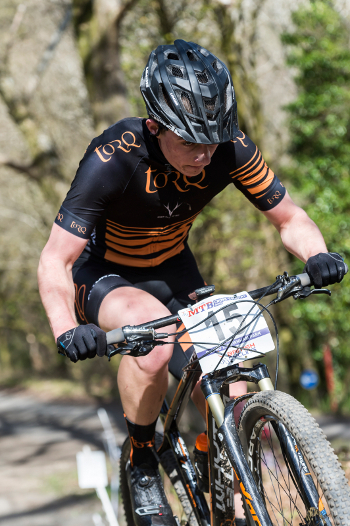 The TORQ MTB Team put in some strong performances at the 2nd round of the National XC Series at Newnham Park, Plymouth – one of the most challenging tracks of the Season and a former world cup venue. Alex Welburn – 13th Elite – After a promising show of form at the opening round of the Midlands Cross Country Series, I was very keen to deliver a good result at Round 2 of the National Series. 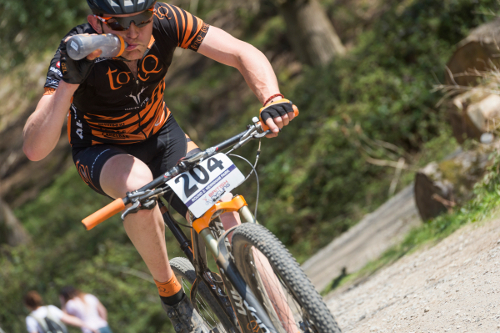 9 technical features dominated the technically challenging course – including drop offs and steep rocky descents with steep climbs too, which would prove to be a hard course both up and down. After dialling my lines in on practice, I was raring to go, number 25 on the grid put me into the 3rd row on the start line. I got a bit blocked at the start, but over the course of the 6 laps, I rode well and with a lap to go, I was in a group of 3 from 13th-15th. I frustratingly messed up my line on the second to last descent, which caused some lost time, but I managed to finish 14th, resulting in not just a solid result, but some more UCI points which will move me closer to the front of the grid for the next race. My aim now is to try and break into the top 10, as I progress throughout the season and get as close to the elusive National podium as possible. Chris Andrews – 23rd Elite – The organisers had done a great job with the course down in Newnham. Lots of new descents had been added, making it a very technically challenging course, both up and down. I felt very relaxed before the start of the race and stuck to my race plan. Start steady. 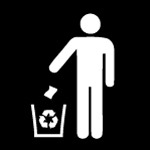 conserve energy at the beginning of the race and then attack towards the end. In hindsight I should have been more aggressive at the start, which saw the whole field pile into the first rocky section and a narrow piece of single track. Once the race had calmed down, I settled into a rhythm and began to pick riders off. The last lap bottle was handed to me and it was time to try and gain more positions. As I headed into the finishing straight, three riders (including myself) were sprinting for 22nd position. I managed to bag 23rd overall. I was happy with this result. I showed composure when things were not going so well and was pleased to see an improvement in my race pace. Role on the next round of the Series at Builth Wells. Lee Gratton – 39th Elite – For me, the second National round didn’t deliver all I wanted! Going into this round, I was excited at the prospect of riding an awesome technical course, that would play to my strengths and give me a chance to mix it at the sharp end of the race. Saturday practice was exactly that! The organisers had pulled out all the stops with this one, and I went to bed a very happy camper. Race day was unfortunately not the one I was hoping for.  I didn’t get the best start and after riding the first half of the laps ‘A’ lines with no worries, a momentary lapse in concentration meant that I lost the front wheel on a loose fire road turn and took a decent soil sample from Plymouth! I got back up and dusted myself down, but with that deep and meaningful pain every athlete recognises, I knew all was not well in my shoulder. I struggled round and finished in 39th despite the pain. I managed to drive home and then visited my local A & E the next day, to find out I’d done a pretty good job of busting my shoulder. I had separated it and torn some ligaments – not good! Rest and rehab ahoy! These things happen though, and sometimes you’ve got to take a little rough with the smooth – it’s not all sunshine and roses. Don’t panic though, I’ll be back in no time. Jules Toones – 10th Elite – The course at Newnham Park was really good fun. We had dry and warm conditions with some great climbs and some nice flowing descents – with some very technically challenging A lines! I am fairly happy with my 10th place finish, although a bit frustrated that I didn’t have the head for the A-lines on race day and missed them out so am looking forward to working on my technical skills. Carla Haines – 14th Elite – I was nervous about the race, but also excited as it was my sort of course and being a Plymouth local, my home event. The descents were good fun and the rocky sections helped to make things interesting on race day. The climbs were very tough, but I felt better than I ever have done. I had a reasonable start. A bottle neck on the first rock technical section spread riders out a little. During the first 3 laps, I found myself riding with Lucy Allen, Ruby Miller and team mate Jules Toone. There were constant changing of positions around the course. I just about held on to the pace on the climbs and gained on my rivals during the descents. After 5 hot laps, I finished 14th. 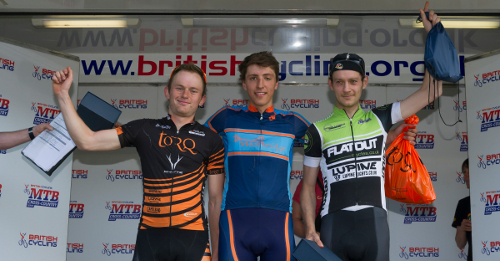 As it was a UCI class 1 race, I managed to get some UCI points – which I’m really happy with. My form is slowly coming through now, so really looking forward to the rest of the Season. 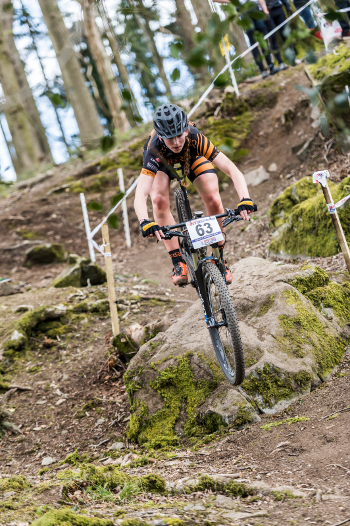 Next weekend I will be racing the second round of the Southern XC Series at Crow Hill. Richard Dunnett – 2nd Expert – After finishing 4th at Sherwood, I was keen to get going for Round 2 at Plymouth. I went into the race feeling confident that if I rode well, I should be able to match my last result or if everything went well even better it. After walking a lap of the course on the Friday evening (to stretch the legs after a long drive), it soon became apparent that this wasn’t going to be a very easy course to race. With lots of climbs, technical descents and rocky features, it was going to make for some great racing. The race started with a fast loop out around the main arena and then straight into the first technical section where the course narrowed significantly, I knew that I needed to be well placed for this first section to avoid getting held up by crashes or the backlog of riders as everyone hustles for position over the rocks. I made sure I would get a good start and went straight into 2nd position behind Paul Loyd (who won at Sherwood), so I knew I was in a good position. The pace remained high for the first sections of the lap and we were soon getting a gap ahead of the other riders (except for one other rider). David Creber soon joined us, stepped the pace up another level and rode off ahead. I considered chasing, but decided to stay where I was and ride within myself, as I knew it would be a long race and I wasn’t sure if David was working too hard. (I hoped he would tire out and I would be able to catch him). Unfortunately that wasn’t to be the case. I rode the first lap with Paul and we both battled for position. I soon realised that I was quicker on the climbs and he was quicker on the technical descents – where I was struggled. So on the second lap, I decided to put in a big effort up the main long climb, to try and get a gap between us and then work to try and hold the gap on the technical second half of the lap. I knew that if I could maintain my lead (until we got back to the climb on lap 3), I would be able to increase my advantage, so that I could relax slightly and concentrate on riding my own pace and keep smooth to avoid any crashes or punctures. I was really pleased with my effort and felt stronger as the race went on. 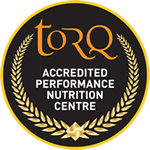 I am now also happy with my great nutritional plan, which really keeps me going – the TORQ 3 units per hour has helped me allot, where I would have previously fatigued as the race went on. I went into the last lap with a good advantage over the riders behind, but I knew I had to keep pushing to the finish line to avoid getting caught. I was relieved to cross the line in 2nd place and gain myself my first podium finish (while racing for the TORQ Performance Team). I went away from the race happy in the knowledge that my training was coming along nicely for my main focus of the European 24hr Championships in just 5 weeks time. Some great performances from all of the team. 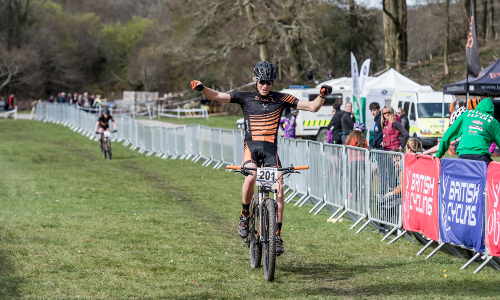 We now look forward to Round 3 of the Series in Forest Fields near Builth Wells in Mid-Wales in a few weeks time. Thank you to Andy Whitehouse of www.amwphotography.co.uk for the images in this report.